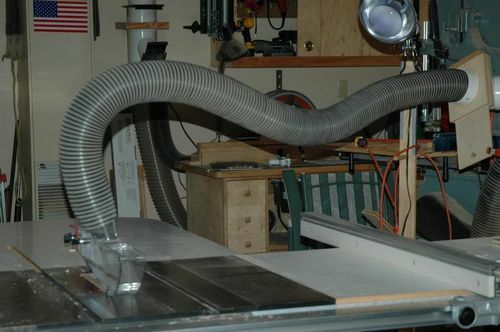 I’ve decided to finally get some sort of dust collecting blade guard for my PM66 tablesaw. Ive tried making one and there were durability issues but definate improvements in collection. My shop is in the basement so dust collection is very important. I have 4” lines for my D.C. Both the Shark and the Penn units are said to work well but the Penn reduces air volume. The Shark is more expensive but is it really worth it? Why? I work with rough sawn material almost exclusively. I often have to rip thin stock too. How narrow of stock can you cut with these guards in place? If I order the Shark, I can get it with a 4” port. Does this larger size port affect the ability to rip narrow stock? Thanks in advance for your help! I have the a Shark Guard with the 4” port on my sliding table saw. The guard itself is narrow, but I’, sure you can get the specs if you ask them. The 4” port doesn’t add any width. The coupler is on the top of the guard and then narrowed and elongated along the guard to allow 4” capacity of suction along the blade path. I hope that makes sense. From looking at the photos of the Penn State guard, the shark guard is much more convenient for me. Mine is a complete riving knife and guard complete in a package. I’m not sure exactly what they have for the PM66 as I think it varies on the year production model you have. With a DC, if you choke down to hose size you get a steep loss of air flow. I didn’t look at the PSI overblade setup, but it used to be a 2 1/2” (I think) arrangement….if that’s still true you will probably be disappointed by the duct collection. I had a Shark on my Unisaw and can tell you they are fantastic. Bear in mind, mine was hooked to a fairly large DC (I sold the saw and the Shark went with it) and had the 4” connection…but it left almost no chips on the saw table. That said, I’m taken by the fact it’s more expensive, typically it’s one of the lesser cost options. Mayne I should look up the PSI unit. I spent a bunch of time and effort trying out shop made blade guards/DC for the saw and when the dust settled I went with the 2-1/2” ARK Shark Guard. It is very well made, easy to use, and Lee does a great job of supporting it. You can’t do much better, but you sure can do a lot worse. I also wrote a product review. Sure there are applications where you can’t use it such as ripping thin strips (<2>), or making tenons with a dado. However, you will have that problem with any guard that attaches to the saw internals. The only way you get away from it is to have a DC port mounted directly above the blade with some serious vacuum and air flow to pull the dust away. I have a PM66 with 4” Sharkguard, splitter version of 3 different heights. It’s a splitter, blade guard, and overhead dust collector. I did not want to go boom arm route like Excalibur or such. Well worth the full price I paid (and I’m really stingy when it comes to buying anything new). Why? Well made, highly respected item from a highly respected man. That always wins me over. With the shark guard in place, you can’t rip less than ~2 inches on the fence side because the guard hits the fence. You can, however, slide the fence forward if you have a unifence/VSCT fence, and can then rip anything with the guard in place. Normally when I’m just ripping one strip I’ll just pull the guard off and cut it with just the riving knife. If I have to do a bunch I’ll pull the fence forward. I went thru this decision process last fall, and got the Sharkguard, with a 4” port. I didn’t want the arm in the way, and also wanted the Shark’s riving knife. Grizzley 2hp dust collector, 6” snaploc pipe to a 6×4x4 wye, so a 4” at the bottom of the saw, and 4” on the shark. It leaves almost nothing on the table, and there’s a lot of suction in the shark. If you go this route, include a blast gate on it so that when you’re cutting off just a bit, those cutoff pieces don’t get sucked into the dc impeller. I’ve decided to get the Shark. Thanks everyone for your help so far. If I do a ceiling mount for the DC hose (4”), is some sort of counterweight needed for the guard to work appropriately? There is no counterweight needed, but make sure there is enough slack in the hose so that it isnt pulling upwards on the guard, and that you can tilt the blade if necessary. I have only had my shartguard for about a week, and the biggest downfall I have seen is that to make a cut with the blade tilted 45 degrees, the guard will hit the table unless you raise the blade significantly. Otherwise, it performs flawlessly, DC with my 4” hose is near perfect, and is easily removed when necessary. Shouldn’t need anything, but you will have to remove the guard for non through cuts, tenons (if you do them with a tenon jig), and maybe a few other things. Make sure you have a way to lay the Shark aside. Here’s how I had mine setup.